The British International School Hanoi (BIS Hanoi) is in cooperation with Juilliard, the world leader in performing arts education, to bring a world-class opportunity to students in Vietnam. During the summer, Ms Laura Rea, a BIS Hanoi Music teacher, had the opportunity to attend training at the Juilliard School. We had a chat with Ms Rea to learn more about the program and the importance of music to children. * Could you tell us something about yourself? Why did you choose to become a Music teacher? I was extremely fortunate that at the age of eight, I had a visiting music teacher lead an assembly at my school; I didn’t really know much about opportunities to play an instrument until that point. Right then, I knew that I wanted to be a music teacher. I went home and asked my mum if I could learn to play the saxophone and everything escalated from there. I could never imagine wanting to do anything else – this has always been my dream. I’m very lucky. * What do you think about the importance of studying music for children? I am incredibly passionate about the importance of Music Education. I completed my Master of Arts Education degree with a dissertation focusing on the impact of music on cognitive development and academic achievement. It is astounding, but music has an irreversible and invaluable impact upon the brain – how it functions, the structure, the capacity and its processes. Over the last 20 years, more and more scientists are choosing to do large research projects on the connection between music and the brain as there’s nothing else like it. Despite the amazing positive effects music has on the brain, it is also hugely important for building children’s confidence, social and discipline skills and providing students a comfortable environment to explore how to express themselves in unconventional ways. As the world of technology is developing at an alarming rate, we need to ensure that we are best preparing our students for the future that doesn’t yet exist – the way we do this is by making them divergent and creative thinkers. How can our students change the world and how can we allow them to believe they can? I really feel ‘The Arts’ are key to this – it allows them to see that anything is possible. * What is the main purpose of the training at Juilliard? What did you learn? We are incredibly lucky to be part of something so special. The collaboration with The Juilliard School is about breaking stereotypes, changing the perception of what education is, and allowing students to do the unexpected and to do it well. It taught me to see a different approach to teaching and learning, new avenues to explore which will really get the best out our students, and take learning to a level that I wouldn’t think possible. I feel like it has been a life changing experience and I feel blessed that I could do this during an early stage of my career. The benefits for all of our students are extraordinary – not just in music, but how this will positively affect their learning throughout the whole school. 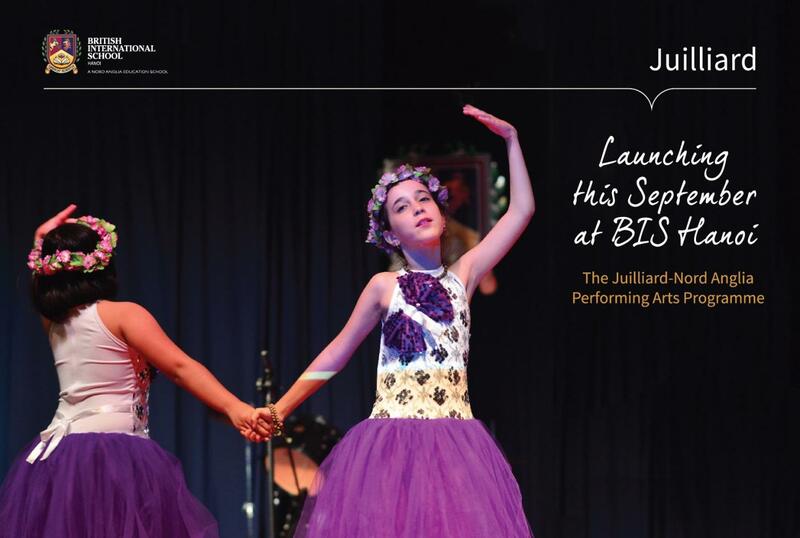 * How can BIS Hanoi apply the Juilliard curriculum in the classroom? The whole curriculum model from Year 1 to Year 9 at BIS Hanoi has transformed. Some aspects will be used to enhance our current practice, but we are now able to really go the extra mile with our students because of the support, resources and pedagogical approach that was shared with us in New York. Every student from the age of five will now be receiving high quality Keyboard skills which will be integrated into their classroom lessons. Our students will be learning a wide range of works from the masters - Stravinsky to Bach, Thelonius Monk to John Williams, Ancient Chinese Music to African music. * What advantages will the Juilliard Performing Arts Programme bring to the students compared to other programs? I feel so confident to say that, in my opinion, this is the best Performing Arts Program in the World. I feel very strongly that nothing else compares. I love to keep up to date with new education initiatives from all over the world, and never have I seen anything like this. As a music teacher, you would never dream of having any sort of relationship with Juilliard. Juilliard is what they talk about in films or in books, or we know it as the place where very famous actors, dancers and musicians trained. I am so excited about what our students are going to be doing, learning, the opportunities that they will have above so many other students in the world. This program will be opening the minds of little ones and big ones, from non-musicians to musicians, from jazzers to classical lovers. This year is going to be incredible for us at BIS Hanoi!